Nearly every day we hear of food safety related issues in the news: salmonella, Listeria, E coli, norovirus, hepatitis a,b,c, Shigella contamination and food recalls. While most people think these issues are concern only to the commercial food industry, the truth is these issues matter at home too. Food safety is a passion of mine. We all expect restaurants to handle the food they prepare safely and not transmit any food borne illnesses. Protecting public health through training and education is expected, encouraged and required by laws and regulations. The general public has a notion of what they expect from a restaurant as far as sanitation standards are concerned but neglect to apply those same expectations to their home kitchens. How well do we do at home? 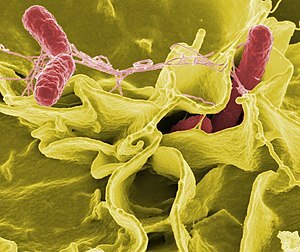 Food borne illness outbreak investigations begin in the victims home. Often it is found we have made ourselves sick. If we look at the top five areas the Center for Disease Control and Prevention (CDC) has identified as the most likely to produce a food borne illness, we can analyze how to do better at home. Let’s take a look at each area and see what we can do to improve the sanitation of our home kitchens. A little knowledge can save a lot of discomfort while preventing a food borne illness outbreak. Know where your food comes from. If you buy from farmers, ask about their agricultural practices. Are they organic? Do they have documentation to prove it? Can you come visit the farm? For grocers and other markets, look around and see how clean it is. Notice handling habits of employees and don’t be afraid to speak up when you see something you think should be corrected. Transport your food from the store to home in cooler bags and properly put the food away as soon as you get home. Use the rule of 2 hours or less out of refrigeration. This includes walking around the store, taking it home, unpacking and putting it away. Do it quickly. Don’t buy groceries and then just “run in for a minute” anywhere. Food has the priority over just about anything else short of a medical emergency. Remember this rule: Any food that has been out of refrigeration for 4 hours or more has to be thrown away. Cook poultry well done. That is at least 165°F (74°C) for 15 seconds. There should be no pink or red juices and no red or pink near the bones. The inside of muscle meat is considered sterile until pierced. So don’t go poking your fork in the steaks for the grill if you want them on the rare side. Poke them only after the outside has been seared. Hot food hot and cold food cold. The temperatures are 135°F (57°C) for hot food and 41°F (5°C) for cold foods. Anything in between is optimal for bacterial, viral and parasitic growth. DO NOT thaw frozen proteins on the counter or in the sink. Thaw in the refrigerator, or under lightly running water that is 70°F (21°C) which means the water is cold, not warm or hot! Always sanitize the counter, sinks, tools, towels, aprons etc. after handling proteins using a bleach solution of 1/8 tsp bleach to 1 quart of cold water. After each use and before starting another one, all used equipment must be washed, rinsed and sanitized before starting another task. Run things through the dishwasher on the sanitizer cycle with heat dry. When was the last time you cleaned out the refrigerator and washed all the drawers, walls and shelves? Do this task on a weekly basis and daily as spills occur. Wash your hands, wash your hands, wash your hands. When handling food, you can’t wash your hands too much. If you have a wound or injury that has broken flesh, cover the wound with a bandage and wear a glove. Do not prepare food for other people when you are ill. If you know what order foods should be stored in, you can avoid the risk of causing a food borne illness in your home. All flying things are to be on the very bottom. Keeping items in this order will prevent any cross contamination. Teach your family how to properly store things in the refrigerator too. Cover and label all food correctly. Date when things go into the refrigerator and then throw them out after 7 days. Cool food before placing them in the refrigerator. Remember to cool food quickly – four hours or less or else throw it out. Use ice baths, cut into smaller portions, increase the surface area by spreading the food on a sheet pan are all methods to cool food quickly before storing. Pack groceries carefully. Keep all proteins in separate plastic bags. Do not mix muscle meats with ground meats; keep them separated. Keep all poultry separate from everything. If you use cloth bags for your groceries, be sure to wash them once a week or more often if they become soiled or stained. Designate different bags for meat and bags for produce. Food Safety is not just for professional food handlers. It is for everyone. A little bit of knowledge can go a long way in preventing some pretty serious food borne illnesses. Implement your own food safety program at home today. If you need any help as to how to get started, let me know. I’ll be glad to help. This entry was posted in Making a difference, The Life of a Chef, What every good cook should know and tagged Center for Disease Control and Prevention, cook, food, Food and Drug Administration, Food safety, Foodborne illness, home kitchens, Illness, poor personal hygiene, sanitation standards, United States. Bookmark the permalink. This is fantastic – really useful as well. 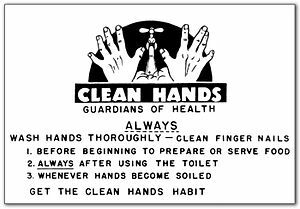 So many simple things get forgotten these days in terms of safety/hygiene. None of it is hard to do. Education is the key!Thanks for stopping by. Great blog, very useful! I remember last year when there was a food scare here in Europe and every vegetable was suspect starting with the poor cucumber. Yes, that was a scary one. It is nice to know that with knowledge about a few simple handling rules we can protect our selves and families from illness.